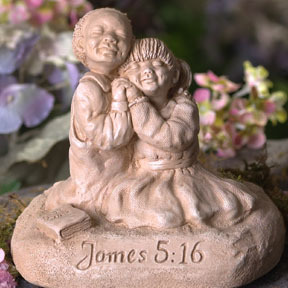 Home > God's Word Sculptures > James 5:16 "Pray one for another"
but the greatest gift we give a friend are simple little prayers. or crying to our loving God to simply plant a seed. or praying for a tired soul when hope has all but waned. what friends are put here for. with this special gift given silently in prayer. I must say that James 5:16 holds a special place in my heart. It is the very first piece in the God’s Word series. I am sure it is formulated, as is the whole series, not just by God given inspiration but also through the prayers of many faithful friends. It was also the beginning of a special creative endeavor between the Holy Spirit and myself. It amazes me to pull a piece of clay out and begin to see its life take shape. What is more amazing is the lessons God teaches me through the pieces. I hear him whisper in my ear, “I need you to portray the embrace that only a prayer partner can give, show the peace that comes from prayer, and from following me. It is also important that you show the differences of their lives, so that all can see that I create different people and that prayer will bring them together.” The direction on these pieces doesn’t always come all at once; sometimes I don’t see what God has done through me, until after they are in production. I am thrilled to see the metamorphosis that these pieces go through, and the life that God gives them. Prayer has played an important part in my life, for me it is simply just talking to God. Letting Him know my fears, desires, insecurities, and need for Him to be Lord of my life. The study of prayer in the Bible is one of my favorite. The use of prayer in my life has been one of the most powerful things I could ever do. I encourage you. Read about prayer. Find a cherished friend and prayer partner and lift each other up in prayer, and begin to watch what happens. But don’t take my word for it, take God’s Word and collect it in your heart. Please remind us to pray, not only to come asking, but giving thanks for all that you do. Please God, bless those who have prayed the God’s Word series through and those who now support this work with their purchases. Please Lord, return unto them blessings-sevenfold. My Dear Father, thank You for using my hands and for sending Your Holy Spirit to bring forth Your Word in clay. 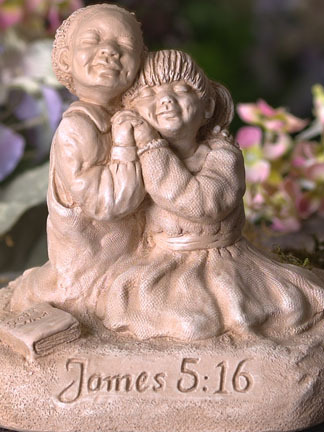 A video about the James 5:16 sculpture.